Disclosure: The items reviewed in this post were either purchased by us or we received as gifts. We use all of them. This is NOT a sponsored post. However, some of the links below are affiliate links, meaning, at no additional cost to you, I may earn a small commission if you click through and make a purchase. All opinions expressed are my own and are not influenced in any way as per my guidelines for this blog. My baby boy is officially one. Where did the time go? It’s been a refrain that I’ve heard over and over again, and now I am bearing witness to it, “The days are long but the years are short.” There have certainly been some long days along the way, but I hold them all dear to me. Malachi is so full of life! I love to see his eyes light up - although sometimes that spark isn’t just joy, it’s mischievousness (“Did mummy just see me put that piece of paper in my mouth, let me run behind the couch so she doesn’t catch me.” Actual transcript of Malachi’s thoughts lol). But that’s okay. Malachi’s birthday celebration was perfectly understated, it was just the three of us at home. We got him all dressed up - button up shirt, blue slacks, tie and vest. He had one of his favorite meals—pasta. We got him a couple balloons, and he had a slice of confetti cake, which he devoured! Although, no extended family was physically present, he was showered with love through calls and text messages and gifts that came in the mail. After opening his gifts, he was ready for bed. Poor baby was knocked out well before 7pm. Malachi’s first solid food was avocado when he was around 5 months. And he hasn’t stopped eating since! He has a very cultured palate. He’s had it all - crepes, Dal (a spicy Indian dish that is right up there with breastmilk and spaghetti LOL), pancakes, fruit, vegetables, etc. The only thing Malachi has not liked so far is…CUCUMBERS! Go figure. He enjoys those fruit and veggie purees and our favorites are from Earth’s Best Organics. We also add Earth’s Best rice cereal or multi-grain cereal to his bottles of breastmilk. He did not care for the oatmeal cereal. Our baby genius already has an affinity for books and reading. And although he also knows how to turn on the tv (insert: face in hand emoji here) and will try to get his hands on the tv remote (yes, he knows the difference) every chance he gets, he would much rather have you read him a book, than anything else. Which I love! We definitely are encouraging that good habit as much as possible. He has his three favorite books memorized enough to know when its time to turn the page, and he will turn the page for us when we’re reading to him. Malachi knows elephant, giraffe, and lion. One of the first things he ever watched on TV was a video of lions. He has a stuffed giraffe and an oversize stuffed elephant that he loves to wrestle with. Malachi started teething around 4 months, although no teeth appeared until after he started walking, which was at 9 months. We never gave him a pacifier, so as soon as he discovered he could control putting his fingers in his mouth he did it to relieve his aching gums. He had several teethers, but his favorite by far was the comotomo teether, probably because of it’s finger like silicone offshoots. There were so many things that came in clutch during this first year, it’s hard to narrow it down. Here are my top absolute favorite things from baby’s first year. I don’t even know where to begin when it comes to singing this bottle’s praises. All my research before having Malachi suggested that you should wait until baby is 3 or 4 weeks old before introducing the bottle, that way the baby gets used to breastfeeding first. I researched numerous bottles and finally narrowed it down to two types. But of course, things didn’t go as planned for us. Since Malachi came a month early, I had to introduce the bottle after only a few days per his doctor’s orders to help keep his weight up. We used these comotomo bottles and to my relief he transitioned flawlessly between bottle and breast. They have 8 oz bottles but we preferred the smaller 5 oz. which can really hold up to 7 oz. There’s something so demoralizing about having to sit holding pumping flanges to your chest. There were times when Danny had to feed me while I pumped. And then when the fog finally cleared I remembered there was a better way. I told Danny about the handsfree pumping bra and he went out and got it. After that my pumping life was never the same - I could eat and pump at the same time, or pump and type. Or pump and clap for that matter. It was a whole new world. This is not the pumping bra I currently own, but I loved this one so much I got it for a fellow pumping mama. This is my favorite because it easily attaches to your regular nursing bra, as opposed to taking off your regular nursing bra to put on a separate pumping bra. 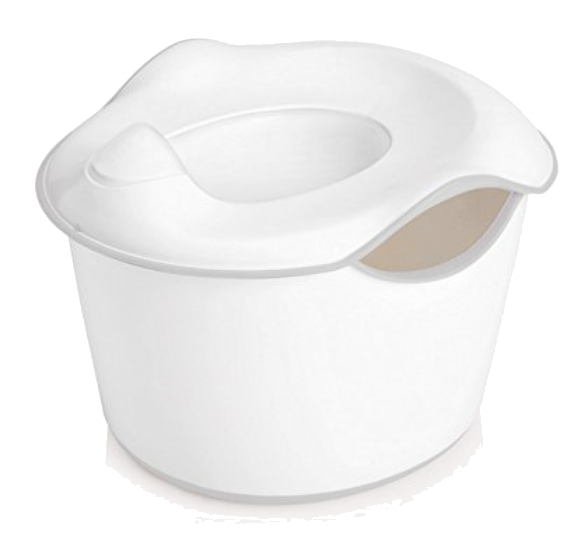 This diaper pail has been great at keeping the smell of dirty diapers contained! It’s easy to clean, and because it is steel inside, the smell does not seep into it the way it would into a porous plastic diaper pail. It’s definitely worth it’s weight in gold, and it’s easy on the eyes too. Now that Malachi is trying to get into everything, I especially appreciate the lock feature, which has successfully kept Malachi out, while keeping the dirty diapers and smell in. It’s totally okay if you’re judging me about the cloth diapers, so did most everyone else when I told them I wanted to do both disposable and cloth diapers. But don’t knock it til you try it. Not only do cloth diapers save you money in the long run. They’re super easy to clean once you get the hang of it. Put dirty diapers (outer shell and microfiber inserts) to soak in a basin and then toss them in the washing machine. We use the Alva Baby neutral solid colors, and never had a problem with leaking. They’re more costly than the other brands out there, but they’re thick, they don’t leave any cotton/fiber residue and they stay perfectly moist. Best of all there are only two ingredients, 99.9% water and a drop of grapefruit extract, none of the extra yucky chemicals. These are my favorite hands down! If you can, definitely buy in bulk and get the big box of 720, it will last a few months well. The Ubbi potty is advertised as a 3-in-1 as a potty, toilet training seat and step stool. But I beg to differ, the potty’s removable inner bowl definitely makes this a 4-in-1 that works perfectly for infant potty training moms. I started potty training Malachi when he was 3 weeks old using the elimination communication (EC) method and held him over just the small inner bowl. When I told people they were skeptical, but when they saw him using his mini potty they couldn’t believe it! When he could start sitting up on his own we used the toilet training seat on the toilet, and he did well with that too. But now that he’s more independent we’re using the potty to give him more control. He uses it several times a day for both number one and number two. At just one year old he is almost fully potty trained. When he’s ready to go back on the toilet, the base of the potty will turn over to become a non-slip stepping stool. Ubbi wins again! This was by far the item with the biggest price tag. Our splurge item. We used the 15% discount we got as part of our Amazon Baby Registry on this and the car seat adapter. Before I got pregnant, running was the core of my exercise routine. When I got pregnant I wanted to continue to run throughout for as long as possible, but I only made it into my second trimester. I wanted to make sure we had a stroller that would not only inspire me to get back outside but would be able to handle me running whenever I felt I was ready to get back to it. The Urban Glide has not disappointed. It’s easy to assemble and to break down for storage. And it’s versatile enough to be used for daily use even in stores. I wouldn’t recommend it for airplane travel, and even in it’s most upright position it is still slightly reclined. But other than that it is a dream. It’s a blessing to watch Malachi grow and to bloom myself in this new role as “mummy.” I’m very excited about all the adventures to come and to continue to share what works for us. If you know any new moms or moms-to-be who would find this information useful, please feel free to share it with them and pass it along. Wishing you a beautiful day!